GPS guidance, variable-rate seeding and other precision practices have provided Ohio’s Brian Watkins with a 145% return on investment. Pictured Above: Working with multiple precision partners has helped Ohio strip-tiller Brian Watkins get the most out of technology including auto-steer, swath control and GPS. He says it’s critical for precision dealers today to provide more than just a singular service to customers. Not every farmer using precision ag technology takes time to crunch the numbers and get a tangible feel for their return on investment. But Ohio no-tiller and strip-tiller Brian Watkins tries to account for nearly every dollar spent on precision tools and how they help improve his family’s 7,000-acre corn and soybean operation near Kenton, Ohio. Since be began adopting precision practices in the mid-1990s, Watkins estimates a 145% net return — or $216,611 — on their ongoing investment in tools like auto-steer, RTK guidance and variable-rate systems. Trial and error, patience and persistence have all been part of Watkins’ precision journey. For years, a variety of different precision brands for GPS and auto-steer were used to control the farm’s multi-colored fleet of equipment. But like many farmers, they struggled with compatibility. Last winter, they moved to one system for field navigation. They use Ag Leader ParaDyme auto-steer systems in each of their 5 tractors, and subscribe to a cellular RTK data plan to deliver Ohio’s free Continuously Operating Reference Station (CORS) signal for corrections. “When we’re planting or sidedressing, we can interchange the systems in our tractors if we need to, because managing multiple brands was just impossible,” Watkins says. Before harvest, Watkins moves two auto-steer systems to their Claas Lexion combines, which also have yield monitors. They have row clutches on their 24-row John Deere corn planter, a variable-rate system on their 24-row Great Plains soybean planter, and variable-rate application capabilities on their Hagie sprayer. Their total investment in technology to date tops $158,000, with the cornerstone of the operation being guidance technology. With auto-steer and swath control, Watkins has improved efficiency, cut fuel and labor costs and been more accurate with fertilizer and seed placement. “When you are driving across the field and steering an implement by hand, I made the assumption that 75% of the time you are overlapping, and 25% of the time you are skipping,” he says. 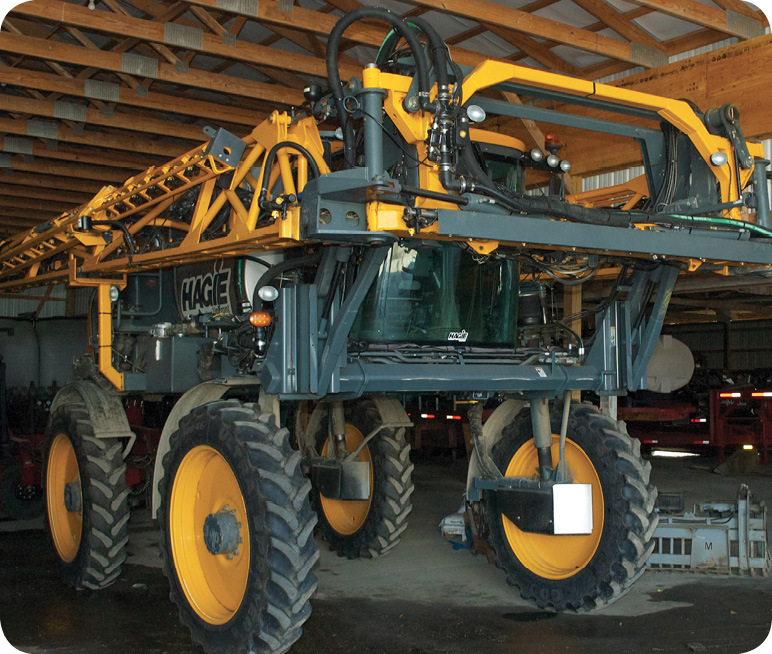 “Part of the benefit of auto-steer and swath control is driving straighter, but it’s also about shutting off the boom on the sprayer when you have point rows or odd-shaped fields. To get the most out of their irregular fields, Watkins researched the benefits of auto-steer and swath control and accounted for variables, including overlaps and skips. While some of his conclusions were based off estimates, Watkins has seen measurable savings from the guidance equipment of more than $156,000. He’s assumed certain costs — machinery, inputs and labor — but also included some hypothetical goals to assess savings. Watkins set price and yield targets of $12.40 and 58 bushels per acre for soybeans, and $5 and 175 bushels per acre for corn, which translated to about $5,500 in savings through the use of auto-steer and swath control. He admits the figure pales in comparison to the farm’s $2.2 million machinery budget, but the savings add up once fuel, labor and input figures are included. Based on estimates of $3 per gallon for fuel, labor costs of $24 per hour and 9% depreciation on equipment, they’ve saved $3,000 in fuel and labor with guidance technology. Using university research that suggests a 12% yield loss in double-planted corn, a 5% yield loss in double-planted soybeans and a 5% yield loss for over-spraying, Watkins says they’ve saved nearly 2% of their input budget through auto-steer and swath control. They typically spray 3,500 acres of corn twice and 3,500 acres of soybeans three times during the year, so being as accurate as possible with those applications is crucial. For planting, Watkins variable-rates their no-tilled soybeans. For years they planted in 15-inch rows, but recently switched to 8-inch twin rows. The move has allowed Watkins to experiment with their variable-rate program, and in 2013 their average seeding rate was 158,400 seeds per acre — down from 175,000 seeds per acre. The change led to a seed savings of $19,125, and a 2% yield increase in their best soils. For corn planting, seed placement is key and Watkins manipulates this manually through the down-pressure monitors on his planter. Although he sees merit in automatic down-force adjustments, Watkins says the manual system is an improvement in their operation. “We have air bags on the corn planter and springs on the soybean planter, but what we see in our soils is the first time we’re planting it stays fairly mellow, and then we get the rain,” he says. “We come back in and it’s a little damp, so we keep the down pressure low. Then, after that rain and 6 hours of sunshine, it starts to get hard. 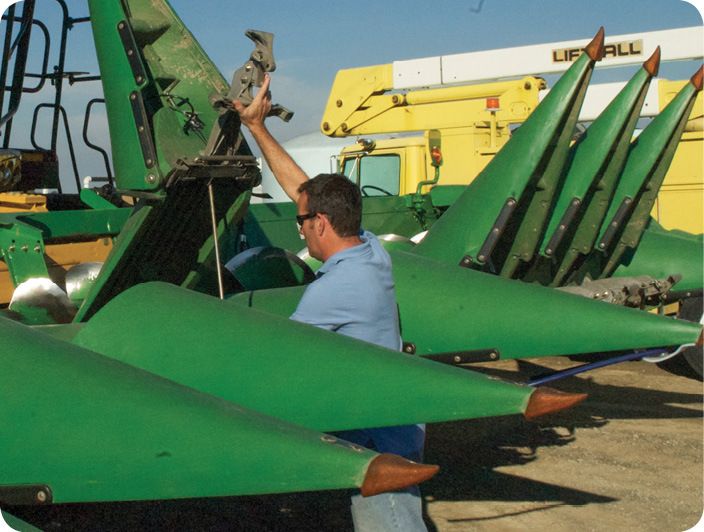 Hardware is only part of the precision pre- and post-planting puzzle. Watkins invests about $95,000 each year in precision amenities, including data-management consulting and soil testing at $21 per acre. He samples in half-acre grids, and the samples are pulled automatically, analyzed and stored by a consultant. The plan is to do soil samples on 10-year rotations. When Watkins Farm first incorporated precision technology, they were almost entirely no-till for both corn and soybeans. They attempted strip-till for their corn, on and off, for about 15 years, but always struggled with getting berms built in the fall. Last year, Watkins came up with a solution. He purchased a 60-foot Progressive toolbar and mounted 24 Yetter 2987 high speed Magnum fertilizer coulters on the bar to apply potassium and phosphorous in the fall with a Montag dry fertilizer air-delivery system. Watkins says he wanted a flat-fold bar, rather than a vertical bar, to accommodate the dry fertilizer hoses. The new setup is “cleaner and easier” to maintain, he says. The goal with the rig is to inject fertilizer in the fall about 4 inches deep in the ground so the soil can be left alone until spring. Then Watkins builds his strips using a Wil-Rich toolbar with 24 Dawn Pluribus row units. Watkins variable-rates his fall fertilizer application and applies at least the removal rate of phosphorous, as well as 100-300 pounds per acre of either diammonium phosphate (DAP) or monoammonium phosphate (MAP). Soil disturbance is so minimal with the fall rig, he says, that a few weeks after applying the fertilizer he can’t tell where he drove in the field. This is where RTK is essential to the success of their strip-till system. He records the A-B lines in fall and transfers them to the tractor in spring to make sure the strips are built over those nutrient zones. 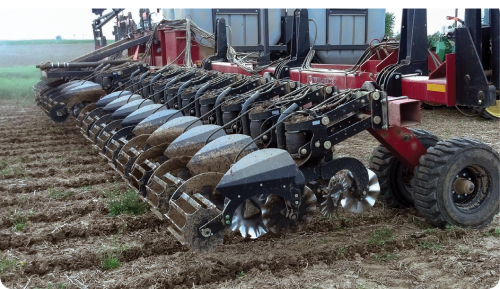 With the spring strip-till unit, they apply about 20 gallons per acre of 28% nitrogen, at least 2 inches deep with a coulter, just to the side of where the corn seed will go. Although they’ve had success with no-till corn, the commitment to strip-till 3 years ago has given them a 4% bump in yield, which translates to a $122,000 profit. Overall, the farm has seen a $92,486 return on their strip-till investment, $23,122 of which is attributable to the use of precision guidance. When Watkins first began incorporating technology on the farm, auto-steer and RTK were the primary targets to improve productivity. To get those early systems setup, they worked with a handful of precision dealers in the late-1990s before establishing a long-term relationship with an area Trimble dealer. Watkins says they’ve always preferred to work with independent precision dealers, rather than through their farm equipment suppliers. In recent years, their focus has evolved from adding additional precision hardware to utilizing data management more effectively. With this transition, Watkins has different needs and expectations from their precision dealers. They now work with a different dealer to service and support hardware, but also to help integrate and format data on their equipment. However, Watkins also works with an independent agronomic consultant for precision data analysis. Working with multiple precision partners is by design because Watkins wants to have choices and options to advance their precision goals. But he says it’s critical for precision dealers today to provide more than just a singular service to customers. As a precision customer, Watkins says he wants to work with dealers who are leaders and will encourage strategies that will translate to profit on the farm. Some dealers are content to have the customer lead them, he says, but that translates to a “middle-of-the-pack” mentality. “It’s better than the end, but the scenery doesn’t change when you are in the middle,” he says. “If dealers are waiting for farmers to be PhDs on statistical analysis, they will be waiting a long time. What farmers are PhDs in is cost benefit analysis, allocating resources and risk management. Although they’ve developed a profitable system, Watkins says there is always room for improvement. As an early adopter of precision technology, he’s learned over the years that it takes time and effort to reap the long-term rewards. With technology rapidly evolving, there are always new opportunities to pursue, and at least some of those are on Watkins’ radar to potentially increase profitability.